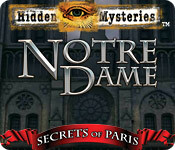 Rated 4 out of 5 by gamefan10 from An enjoyable game Hidden Mysteries: Notre Dame - Secrets of Paris is an enjoyable game to play. It's not the longest game, and not the most difficult. But if you're looking for a fun game with an interesting story, this should do it. You're helping the bishop find a very valuable missing icon. Your journal gives several good clues during the game. A good map shows all the areas that have tasks to do. You can make the game much more difficult by not looking at the map as you play. When you see sparkling lights, that means there is a hidden object scene. The art work is very good and the objects are not hard to find. There is no penalty for clicking, so if you're not sure where an object is located, click away! Some scenes are repeated in the game, but different objects are listed. There are several good mini games to solve. A little question mark in the upper left corner gives you directions for the mini games. There are also a ghosts to help you along the way. At the end you find out what happened to the icon and "who did it". I enjoyed the game very much! Rated 4 out of 5 by Friar from Notre Dame Mystery If you are a fan of HOG, this is definitely for you. Many, many HOG scenes. Fairly simple and easy to find, but there are enough to make you say, wait a minute... Graphics are not the best for the HOG, but that is not a problem. The map lets you find your way around and will show you where you need to go. Overall I liked this one very much and would recommend to everyone. Rated 4 out of 5 by panjee from GREAT HOG FUN EASY ONE Played this twice now and still enjoyed it. Map very helpful tells where tasks are so no guessing what to do next. Due to this I find the game way too easy - too much hand holding. if you're new to HOGs you got to try this! Takes lots of patience tho' as heaps of going back and forth - map is not interactive. Still good fun. Rated 4 out of 5 by RevKellie from Interesting Tour of the Cathedral This was a great game to play and a lot more fun than it looked from the preview. The "clue givers" were all interesting historical figures, the story rolled along quite well, and the notes gave you a fast history of the cathedral. You also got a sense from walking the map how vast and expansive it can be even though it doesn't look like it. The map is a huge help, as are the clues. The HO Scenes are well done - good art and the objects require a little looking but stand out. None are too small or indistinct. The puzzles are average. Not so brainy you need to skip them - not so easy you breeze by them. It seemed a little short - but I also didn't want the story to end. Rated 4 out of 5 by einiespal from Good game I thought this game was very well done and was very enjoyable to play. The map is great showing where there are tasks, so you don't have to wander around wondering what to do. The HOS were good - clear objects unlike some games. The usual suspects in the puzzles. The graphics are good, and the story is OK . Rated 4 out of 5 by turfgrrl from Great Game This is a great medium difficulty kind of game. 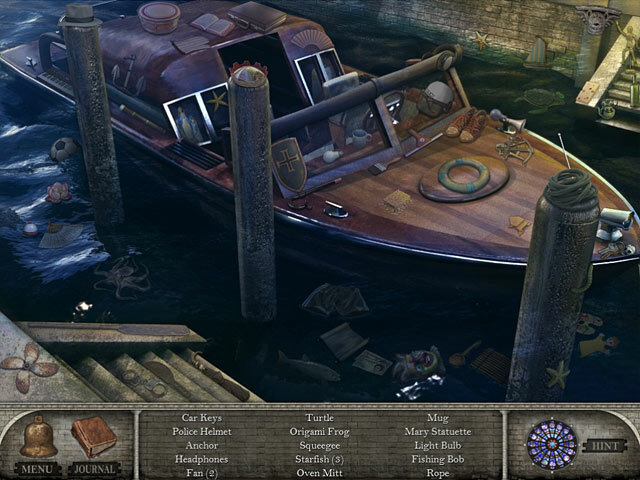 For seasoned hidden object gamers, the challenges might not be hard enough, but for passing some time with an engaging quest, and helpful map, this is a great game. The artwork is well done and the game is responsive. Rated 3 out of 5 by Kimmycoo from Large Playing Field I must say I was so surprised at how this game was created. It was almost like one of those large file Adventure games. I say that only because once you start the game, there are so many ways to go, so many open doors that at first you become overwhelmed with thinking..which way should I go. However, its just fine as you have a map, that shows you your location and also shows you where you need to go next. 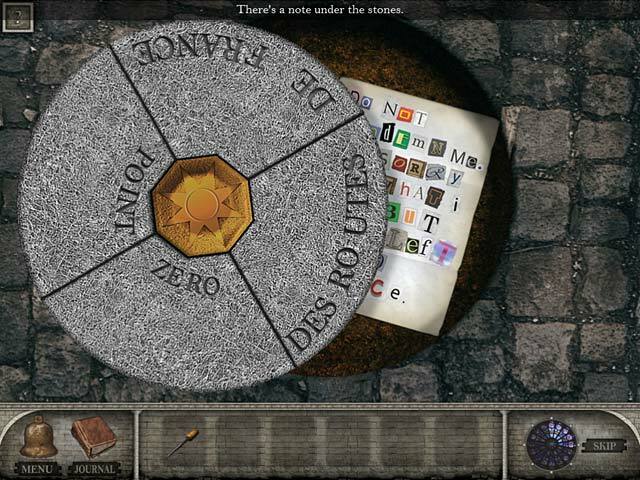 I really liked this game, and at the same time it had some educational snip its here and there about Paris. The playing field was big, the music was nice, graphics were good, puzzles were fun, this is a short game though, I beat it in a matter of 3 hours. I recommend it! Rated 3 out of 5 by Titania from Could have been better I was quite disappointed with this game, Way to many HO scenes, although the graphics and sound were very good, there were not enough puzzles and the ones there were I found way too easy. overall I found this game to be rather boring, but if you love HOs you may enjoy it. Rated 3 out of 5 by centauri272 from Short and easy The storyline is interesting. There are a lot of HOS; the graphics are clear. The puzzles are very easy. The map is very useful. It took me less than 2 hours to finish it. I would recommend it only for beginners, or if you need a break from more challenging games. Rated 3 out of 5 by Mouse381 from If Only... This review is based on playing a demo: I wanted to like it, but too much running around in circles and going back and forth. It made me dizzy after half an hour of playing. The graphics were well done. The map was helpful. That's about it. There was hardly any sound. ALOT of the same HO scenes over and over. I played the demo for 30 mins, then quit. I was too lost and completely turned around to finish. I spent more time looking at my map trying to figure out where I was and where I should be. It's a No Buy for me, even with the DD price. Rated 3 out of 5 by MEnr56 from EXPERIENCED PLAYERS NEED ONLY APPLY This is NOT a bad game but I found it very overwhelming for me -- *too much traveling around in circles *much too easy to get lost inside the church *no clear indication of where to go next *no clear indication as to what to do next - despite inventory items *mini-game instructions button (FINALLY found it almost at end of game) way up HIDDEN at the left top of scene except for a tinge of gray coloring sticking out *music was depressing I have to say that, when completed, I was happy as I found this game more of a task than a pleasure; thank goodness for the walkthrough Those of you that are very experienced playing Adventure games would probably enjoy this game but I've not yet achieved that understanding of how to proceed in such games. Rated 2 out of 5 by FamilyDad1 from Yawn Around every other turn *BOOM* the game hits you with yet another Hidden Object Scene! This was great back in 2005, but it doesn't work today. Gamers expect more substance. You don't really get to go inside some of the locations, instead when you finally do unlock them, they become just another hidden object scene. Lazy on the developer's part if you ask me. There were at least 8 in the first 20 minutes, that's 1 every 2 minutes, way too many! Worse the scenes repeated. The lack of people and still graphics were enough to put you to sleep. It seemed there were a couple of clever puzzles, such as the mystery note containing the combination to get inside the rectory. And being in Paris, they had some cool iconic references, but the entire city felt dead and abandoned with no signs of life anywhere. The journal, map and task system were all great ideas to include, but it was the heart of the game itself that wasn't beating, again due to so many HOS thrown at you literally around every single corner. Enough already! But most confusing of all is how they allowed the HIDDEN MYSTERIES name to be tarnished like this, when I just finished another HM title: GATES OF GRACELAND and absolutely LOVED IT!!! Maybe these developers should take notes from that team next time. Rated 2 out of 5 by megwoman25 from Yawn This game is rather boring. I think I got a deal on it because I remember not caring so much for it so it must have been one of those deals that springs up randomly when you make a purchase. How I wish it didn't spring up. 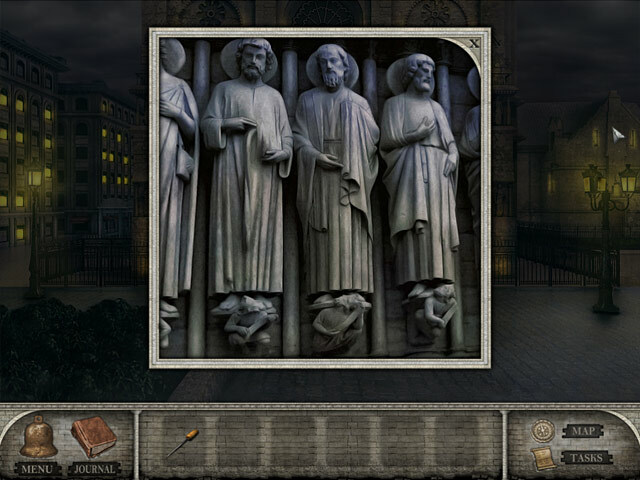 The game takes place at Notre Dame church and around it. I liked all the different doors being locked initially but once opened they brought you nowhere special. There were a lot of tasks that needed to be done later and they seemed epic like what should be found within them would awe the audience but it would be a piece of colored glass or a brick. WOW. (sarcasm). I only own one other hidden mysteries game so they really aren't my cup of tea but I found this one terrible. Every other scene is a hidden object scene and its a complete junkpile. Find a butterfly, horseshoe, vacuum cleaner. I think I found a fleur de lis (spelling?) in every single scene and a horseshoe! If you are going to have sooo many hidden object scenes then you need to mix it up! not to mention none of them were interactive which just is a bore when there are soooo many. There was hardly any adventure, just hidden objects galore. I would have liked more period pieces instead of modern items. It was just a lackluster job. The graphics were bad and the storyline was a mystery that ended badly in my opinion. I can't believe I even got through this game! The only upside to this game was there was a map that told you what and where you needed to go but it also told you things on the map that you couldn't do yet so you had to decipher which makes the game a little tougher but just a little. The reviewer who said this game was just for expert players is wrong. I consider myself an expert player and this game was too easy in the puzzles and hidden object aspect so maybe figuring out where to go and what to do is hard but just use the map. Too bad its not jumpable because it would have made that part a bit better but overall the game was just lacking something. No voiceovers, no interactive scenes, not an engaging plot. I don't recommend this game. Rated 2 out of 5 by Jeana78 from Disappointed! Very Easy Game! Only took about two hours to complete. No audio, basic graphics. Both games and puzzles were far to easy to even be interesting and items were given to you right before you needed them, so you never wondered were to use an item or kept them in your inventory for very long. The storyline could have been good if the level of challenge was higher. I'm sorry I spent the credit. Rated 2 out of 5 by shirley301 from Low grade production No voice acting, no movement, no music, easy puzzles. The only redeeming factor was a helpful map. Rated 1 out of 5 by jms424 from Terrible Lots of HOS that were easy and boring. Puzzles were few and easy. Story was awful and boring. The game was short, short, short. Took me 2 hours with no hints, no walkthroughs, no skipping puzzles. Graphics were boring and dull. Music was boring. Rated 1 out of 5 by AutismMom00 from One of the few BFG I actually hated I kept feeling as if I was walking in circles. It was distracting, scattered, and it was like a couple of different games tossed together and this is what was spit out. I did not even finish the trial. I think I still had about 30 minutes left and I just clicked out and deleted it off my computer. I was NOT impressed in any way. If I remember right, this was the game that also had a confessional on fire. I am not Catholic, but I did find that a bit disrespectful. The fire was put out easily, but I just was taken aback by it. If BFG ever has a poll as to which game I never want to see in their line up, this would be in the top three.